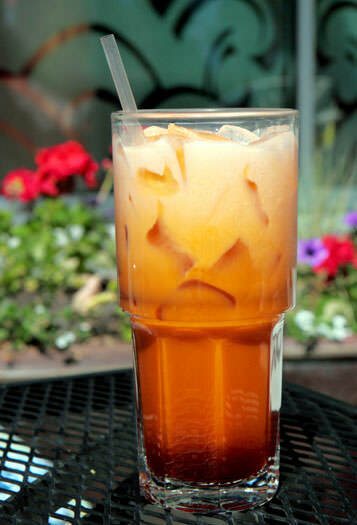 Pulled Thai Tea "Cha Chuck"
Thai Iced Coffee. We now offer the traditional, unique Thai iced coffee drink known as "oleang" which is a blend of coffee, sesame and corn. 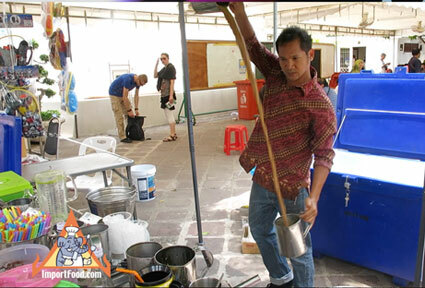 Thai Coffee: for complete preparation instructions, click here. Below are testimonials received from customers about our Thai tea. Anne, Spokane WA. Having recently discovered the amazing taste of thai ice tea, I knew I'd have to make my own! 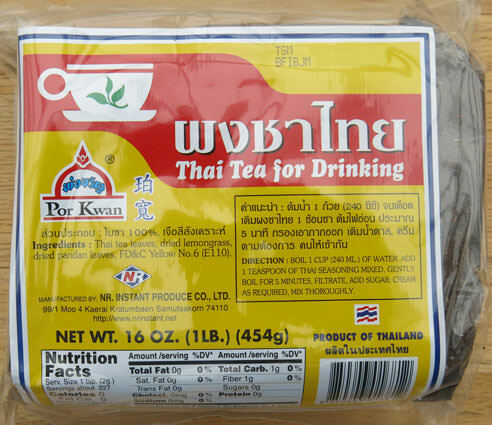 I stopped by the local thai shop and discovered that they buy your brand of tea! I immediately ran home and ordered my own! After receiving the package, and making my first batch of tea, I am happier than I could have ever hoped! The tea is perfect, and you will most definitely be getting repeat business from me! thanks again! Kathy, Erin TN. We received the Por Kwan tea today. I cannot express how happy we are to have our favorite tea! Thank you so much for you time and attention. We will be ordering from you again soon. You may even attrack new customers as we share our delicious Thai Tea during the Christmas holidays. Thanks again. Christopher, San Mateo, CA. I just received my order today. I love the Thai ice tea mix, I will order more for sure when I run out. You have a great service, keep up the great work and I look foward to seeing what new items you have added, I am sure I will order them. Steve, Yorktown, VA. I recently ordered thai tea from you folks and am thoroughly impressed!! My wife and I love thai food as well as what your web site has to offer. You can count on more orders from us in the future. Thanks and keep up the good work! Joe M, Portland OR. Thank you very much for your speedy response. I also ordered some of the Thai Iced Tea. It is wonderful!! And so easy to make. I will return to your site when I run out and to shop for more exquisite foods. DMR, Sun City CA. I received your products exactly as described and exactly when they were supposed to be here(Thai fresh produce, Tom Kha soup base, Thai iced tea) and I love them! Can't wait to make soup tonight with the fresh produce I got! Thanks! Xochitl, Montebello CA. I just finished brewing your Thai ice tea and I carefully followed your instructions and I am so very happy. It tastes exactly like the one sold in Thai resturants. Awesome. Thank you. Hunter, Bellingham WA. Thank you for the prompt shipment of my Thai Iced Tea Mix and Filter. I opened it immediately and began brewing my tea. I will definitely do business with you in the future! Thank You & Namaste. Violet, GA. This mix, is a blend of leaves that are really fine, we made it in the coffee maker. I did purchase the cloth strainer, but that should be used for large amounts of tea. The coffee maker did just fine, make sure you don't use too much mix though, it's concentrated stronger than coffee is, so please take note of the instructions when it comes to measurement. It tastes delicious, just like I like it. I did not have condensed milk though, so I had to use regular milk. I will admit you definitely need the condensed milk if you want it to be like the restaurant's style. But it had the same flavors, the regular milk tended to water it down a bit. I sweetened it with normal sugar, everything was fine. This is a nice size bag, you should have enough for awhile with this one. I recommend this if you love Thai Tea like I do. Lydia, Lyons IN. I went to a Thai restaurant for the first time in July(2009). I noticed that a girl at a table near us had a drink that was orange colored so I asked the waitress about it. She told me that is was a Thai Iced Tea and what was in it. I ordered one and absolutely fell in love with it. I have been looking online for the mix and finally found here at Importfood.com. I received my order a couple days ago and had some last night. Thank you so much for providing this product to the public. Now I can have one of the best drinks at home! Isabel, Hendersonville, NC. My box of Por Kwan Tea Mix arrived today and I immediately set a pot on the stove following your excellent instruction. The fragrance was intoxicating...exactly what I remember from good Thai restaurants. I've been searching for just such a product for literally years! Natalie, Seattle WA. Hello. I just wanted to tell you how much I love the Thai iced tea mix you sell (Por Kwan brand). I have been trying to make my own Thai iced tea for a while now and never found a bag of Thai tea that I liked or that worked out very well. I ordered the one on your site and made it using the directions you supplied (thank you) and it turned out exactly how it tastes at a good Thai restaurant. Now I can save money and make my own. Thank you so much! Rhiannon, IN. Many years ago I discovered you to be about the only place to carry not instant Thai tea, but the kind that you actually had to brew. I've moved around a lot and am fairly poor, but by heavens at least once every year (and a couple years twice a year!) I order the three for 12 or so bucks of the brewed thai tea that you carry, I practically live on this stuff, and it is very forgiving regarding brewing, I can't always do it like you instruct, but I have found a number of ways I can fix it and it's ALWAYS good. Thank you for continuing to carry this product all this time, for having it a reasonable price...please don't ever drop it from your inventory. Thanks to it I've also occasionally ordered other items here and there to experiment with and get to enjoy a wider variety of flavors and cooking experiences. You folks are wonderful.